As a result of the training he received at the world-renowned Campbell Clinic in Memphis, Tennessee and his many years of experience, Dr. Greg Behm offers world-class treatment in a compassionate, unhurried fashion–with effective results. During his training, Dr. Behm’s goal was always to take the “big city” techniques he learned to small-town America. Ironically, now people from the big cities are coming to see Dr. Behm to have their treatments done in the small towns of Hamilton, Montana and Salmon, Idaho. 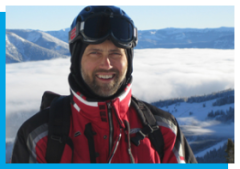 An avid skier himself, Dr. Behm fully understands the importance of sports in people’s lives. He offers state-of-the-art treatments for sports injuries such as rotator cuff tears, ACL injuries and fractures. While the nature of injuries varies greatly, Dr. Behm’s goal is always the same: restoring you to your previous level of performance with minimum delay. In addition to sports medicine and general orthopedic care–such as the treatment of fractures, sprains and trauma–Dr. 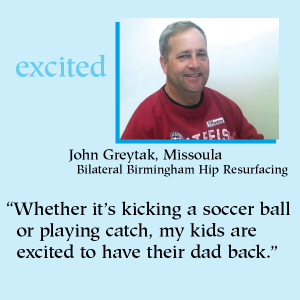 Behm offers the latest proven techniques in joint replacements and sports medicine. These techniques include Verilast™ total knee and total hip replacements, the Visionaire™ total knee replacement, the Birmingham Hip™ resurfacing procedure, arthroscopic rotator cuff repair, and arthroscopic surgery for knees, shoulders, and ankles. Dr. Behm treats patients in western and central Montana (Missoula, Helena, Great Falls, Butte, Bozeman, Billings), as well as in eastern Idaho (Salmon, Idaho Falls).